As a druid The Summer Solstice is an important time. For me, this importance derives wholly from the energetic aspects of this date, and has very little to do with its symbolic or cultural context. In previous years I have paid little attention to the Solstice event, preferring to take myself away to Glastonbury in an attempt to find some level of spiritual connection simply by being in this place at this time. However, this year the Solstice has a powerful energetic significance – it will be the fullest empowerment of the Sun, and also a Full Moon (Hay Moon). 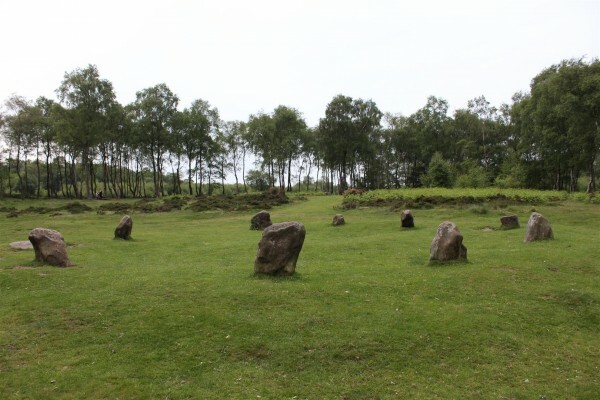 In preparation for the Solstice weekend I reviewed the task I had been set between Beltane and now – to be able to create a Perfect Shield of energy. Yes, I could do that. It took a strong will, and focused intent, but in Thor’s Cave I had demonstrated to myself that it could be done. Was there anything else I could do in preparation? I decided to get Kal to come out with me to some sacred sites to check. He suggested Derbyshire, and so we went to some old favourites – Nine Ladies and Doll Tor. 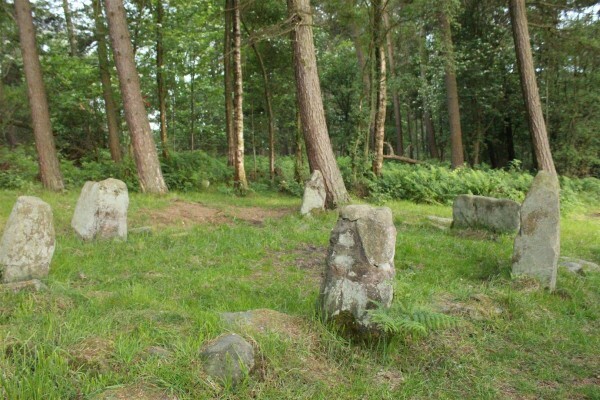 It’s not unusual to see people around the Nine Ladies stone circle. Around this time of the year, though, preparations are underway for an informal gathering of like-minded revellers and … well… let’s just say “pagans”. So we didn’t have the area to ourselves this evening, we were sharing it with a practising witch and a visiting couple with Midlands accents. Nevertheless, one thing I have learned to do recently is to use the Sword of Will to really focus my intent upon my own work. Initially, however, I bimbled around taking photos, feeling the energies (nice) and speaking to various trees (loon). Today I was attracted to a bifurcating birch so I perched myself there and made it my base camp. No tent required! When I felt ready I set my goal: to be taken to something that would prepare me for the Solstice. and finally a wobbly band of female around the lower sacral chakra. Altogether they attuned my energies such that I was balanced. Somehow, the places I was taken to were the correct form of energy to interact with my energy field in such a way as to being it into alignment. I felt…. totally balanced! However, as I came away from the power centres feeling quite pleased about the result something struck me. Should I have been balancing the energies of the power centres, rather than the other way around?. Maybe this was a thing like the Perfect Shield. That energy form would require discipline, and would need to be a perfect circle of energies? Was I being shown that imbalances can cause balance, or that I had work to do at sites to get the energies spinning truly? Kal had no such issues or doubts (he’s not following The Doubtful Path!). 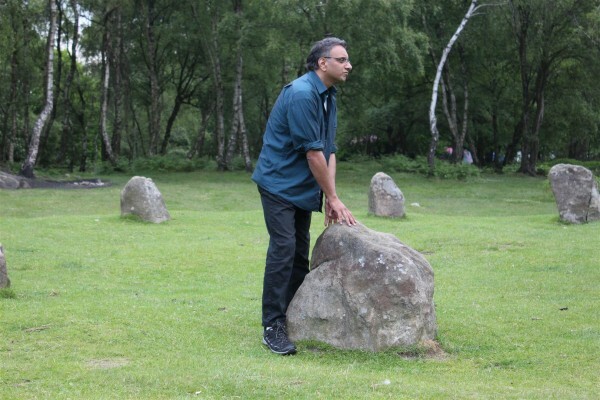 He was busy working with the energies of the stones in the circle. Having finished at Nine Ladies we moved on to nearby Doll Tor as the sky began to darken with building cloud cover, yet we knew the light should hold for another few hours. The louring cloud made the move to Doll Tor seem more sinister, and matched the mood that the circle has always evoked in me. Yet the draw of the circle was strong tonight and no amount of sinister portents would change that. For me, sinister is the other side of benevolent. Both sides are a necessary part of life’s cycle as night is a partner to day. 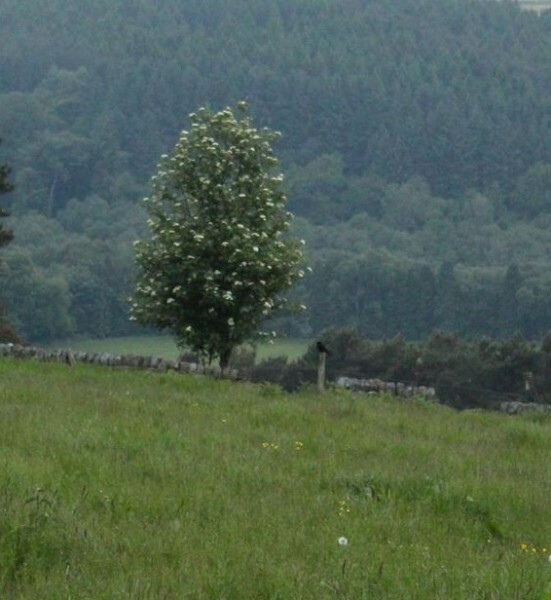 As though enhancing this mood there was a lone crow sitting on a fence post next to an Elder tree in the fields alongside the path down to the stone circle. It never stirred as I approached close and closer to being parallel with it. Its beady eye watched me determinedly. Kal was a hundred yards behind me, and as soon as he walked through the little iron gate at the top of the hill the crow cawed, as though it has been expecting him. Then it took wing and flew off down the hill – a direction that Kal would later follow himself without realising that the crow had blazed the trail beforehand. I asked to be taken to a place where I could learn more about my pre-Solstice balancing work. The dowsing rods took me to a place outside of the circle. That’s’ not unusual. At Doll Tor I have NEVER worked inside the circle. I have no idea why. Maybe it’s just too incompatible with my energies? I will have to find out. After completing the contemplation I admired some of the darker aspects of this little circle. 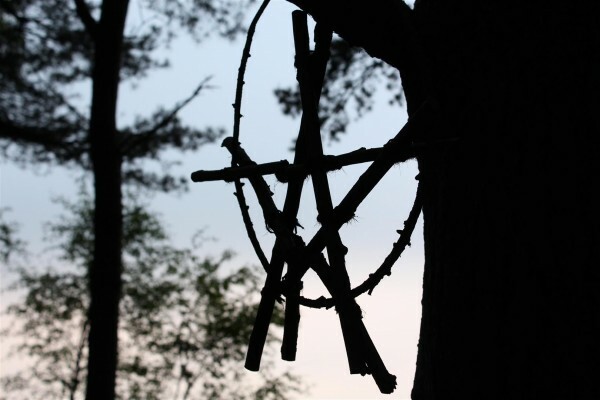 Hung all around in the trees were magickal emblems decorating the circle’s periphery. Hmmmm….can’t people work without leaving trace? Not something I “admire” but they created an interesting ambience in the setting sunlight. I came away from the circle feeling that Doll Tor had been the ‘darkness’ the ‘light’ of the Nine Ladies. Together they had demonstrated the balance of forces that I felt were going to be the theme of the forthcoming summer solstice.